This post is all about finding great SEO opportunities. 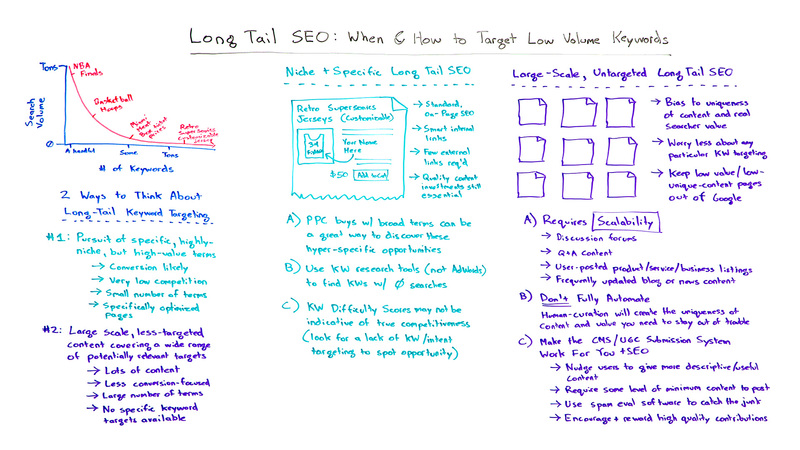 That’s why today we’re writing about the benefits of long-tail keywords for SEO. If you’re after heaps of high-converting traffic for your website? Or you’re looking for ways to increase revenue for your business? Look no further than long-tail SEO. Typically, it’s easier to rank for and get traffic from long‐tail keywords. There is, of course, a demand curve in the SEO world. To make this Kiwi friendly we’ll be using “Rugby” as our example topic today. Popular keywords like “rugby finals” will have high search volumes. But Wikipedia, Sports News sites and more will dominate the rankings. The phrase “rugby boots New Zealand” might have a smaller volume of searchers, but it’s still pretty high. Yet, “Crusaders rugby union box ticket prices” is very specific and there may only have a few dozen searches per month. There are also ultra long-tail keywords like “second-hand Crusaders custom signed rugby jersey”. This phrase may only get a few hits per year, but could still be very beneficial. Firstly, it’s crucial to know that long tail SEO keywords are divided into two groups. You’ll use one or the other depending on your business and SEO goals. Depending on your website you’ll either subscribe to the niche and specific long tail SEO philosophy or the large-scale “blast” long tail philosophy. For many businesses these long tail keywords – “second hand Crusaders custom signed rugby jersey” can actually be quite valuable. These keywords are worth going after even though they may have a small volume of keyword searches. Conversion likely terms. We know we are going to convert these searches into buyers. Very low competition, because not a lot of people know about these keywords, there aren’t a lot of sites targeting them already. You can rank with no external links, internal links only. What types of terms should these be…? Firstly, they will need to be extremely specific. Like our example “second hand Crusaders custom signed rugby jersey”. Conversion-likely, meaning that if we get these searches they are most likely going to convert into buyers/subscribers etc. Very low-competition keywords, obviously that’s the point. You’re unlikely to reap the benefits from long tail SEO if a lot of other websites are targeting your terms too. Ideally, these keywords or phrases should be long-tail. Meaning Google and other search engines aren’t able to pick them up using Adwords or other tools. That is how low you want the volume of searches for your chosen terms to be. You don’t need to be targeting all the long-tail keywords you can think of. We’d suggest between the tens and hundreds depending on the size of your site. You will gain the most by making sure you’ve built specifically optimised web pages for each of those long-tail keyword terms. Remember, your goal is always to convert. Optimised pages will make sure those searches turn into buyers/subscribers. Or whatever business goal you’re trying to achieve. Get online and check out some industry forums or social media sites. What questions are your potential customers asking? Google Autocomplete. Not only useful for the sometimes funny Wired Google Autocomplete interviews… but also a very effective tool for finding long-tail keywords. Building the optimised web pages for your niche & specific long tail SEO keywords. Firstly, we hope you follow all standard on-page SEO best practices on any pages you build for your website. Let’s talk about linking. So, in this case, you will need to be using smart internal linking everywhere applicable. However, external linking is actually pretty unnecessary. Your long tail keywords should still rank with no or few external links. Internal links are king for long tail SEO. No matter what quality content is essential. We can’t stress this enough. This page still needs to convey visitors and it needs to be indexed by Google. Opting for either automated or low-quality content will ensure that your investment in long tail keywords and getting visitors to your page is wasted. Remember, these keywords are niche and hyper-specific! There won’t be heaps of people searching for them, so when people do your page needs to serve searcher intent. This alternative approach consists of more of a “blast” approach, covering a broad range of keyword targets but less targeted with our content. This approach is very site-specific if your business doesn’t produce a lot of content, this probably isn’t the right method for you. Less conversion-focused overall. Often with long tails terms, we don’t know the intent of all searchers. You need to be targeting a lot of the long-tail keywords you can think of. The more the better. Content over specificity. In this case, it’s much more important to focus on the quality of the content, over the specificity of the keyword targeting. With the “blast” approach, you’ll find it covers a wider range of less targeted words but is worth the work. Your site will have higher authority by the amount of content that is available to users. Search intent is the main thing we need to consider while we approach optimise long tail keywords. Long‐tail keywords are highly beneficial to your business and should be taken advantage of. Although targeting long tail keywords, creating good content and web pages can be timely. It often will pay off. We can’t guarantee that you will always rank for each long-tail keyword you target nor that your site authority will definitely improve. But you can definitely get tons of relevant traffic with high chances of conversions if you target the right kinds of long‐tail keywords. Think about having a webpage that only gets a couple of hits a day, but the website could have 10’s or 100’s of these highly targeted pages. Those 2 hits, on multiple pages over 365 days per year mean you’ll end up with tons of relevant traffic. Most of your competitors probably can’t be bothered chasing down long tail keywords, you can benefit greatly from their missed opportunities. If you keep writing relevant content based on your chosen long tail keywords, your webpage could rank on Google’s first page overnight. Your domain authority is also likely to improve by having great content and long-tail SEO. Long‐tail keywords are a great SEO opportunity for all businesses and should be taken advantage of.